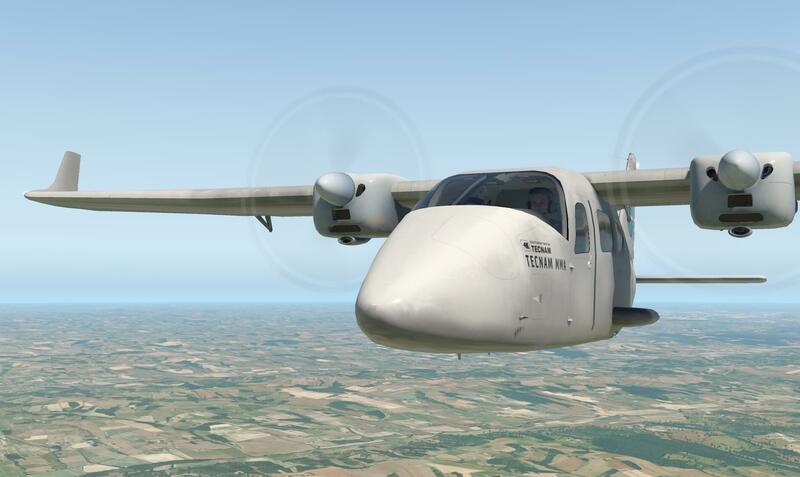 Ever heard of the Italian aviation manufacture Tecnam? Perhaps you have, perhaps you haven’t. The following shows you that Tecnam isn’t just a company that started some years ago. No, it’s much more then that! 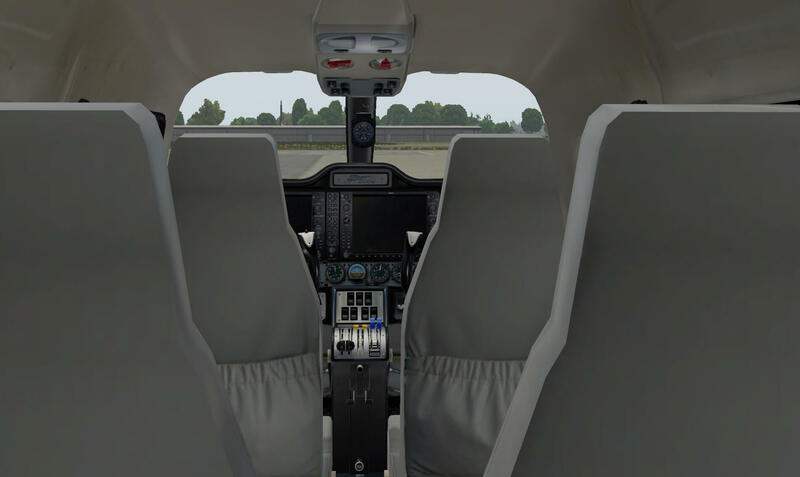 The introduction into service of the P2008 and the next generation four-seater, single engined P Twenty Ten, ensures that Tecnam continue to offer the widest range of General Aviation aeroplanes. 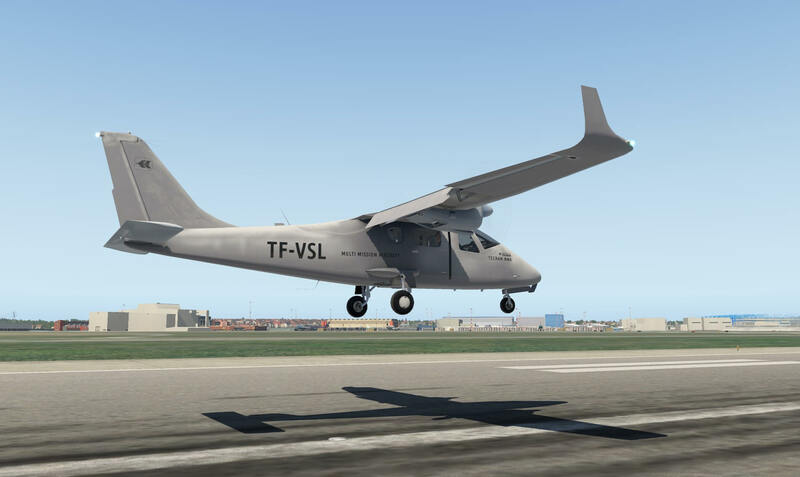 Today with the development of the P2012 Traveller, Tecnam will offer an innovative aircraft for regional airlines. With over 6,500 Tecnam aeroplanes operating around the world today, Tecnam customers and operators are supported by a global network of over 60 dealers and more than 100 Tecnam Service Centres. 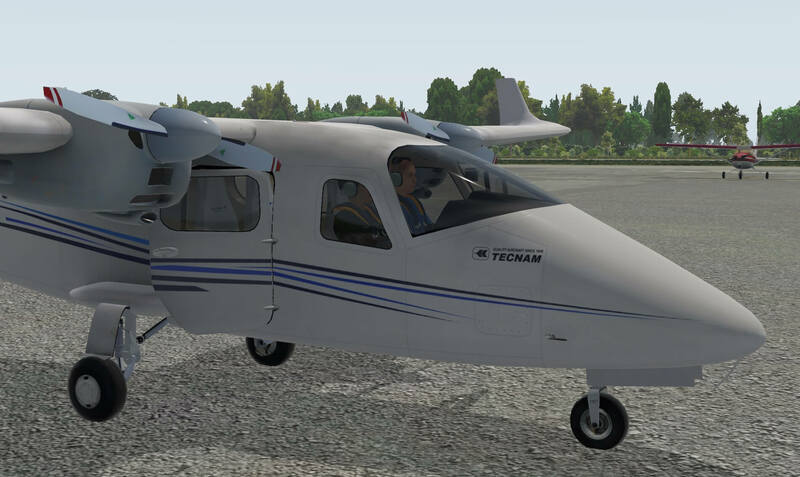 Tecnam P2006T is a twin-engine four-seat aircraft with fully retractable landing gear. The superior high-wing configuration offers stability, superior cabin visibility and easy access for passengers and luggage. 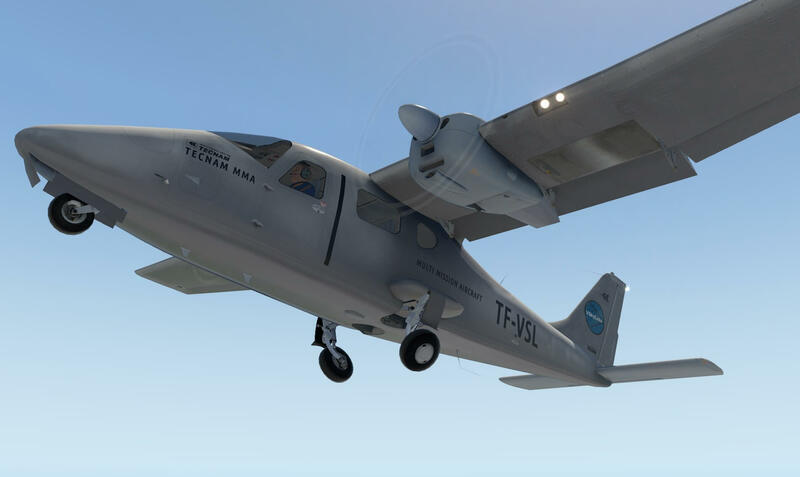 Tecnam has used its extensive experience with aluminium airframes to create in the Tecnam P2006 a robust yet very light airframe, resulting in an outstanding payload-to-total weight ratio. 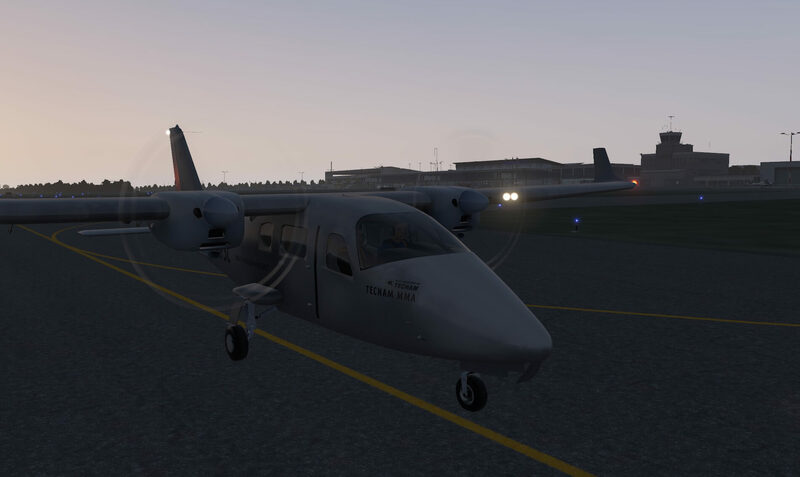 My first impressions cover the external of the aircraft model version 4.0, released on November 11th, 2017. 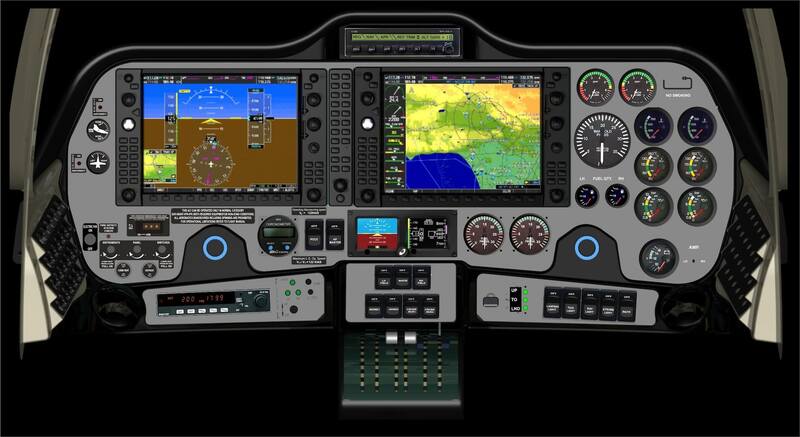 I’m aware that VSkyLabs has modeled two models, one with an analog and the other with two G1000 DUs (Display Units) installed with on the right-hand side ordinary instruments. 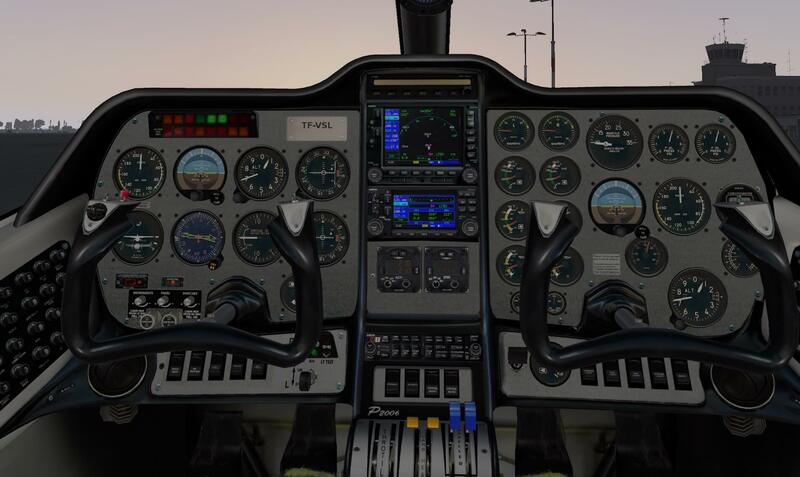 I third real option is the G1000 look and feel with on the right-hand side vertical tape instruments. 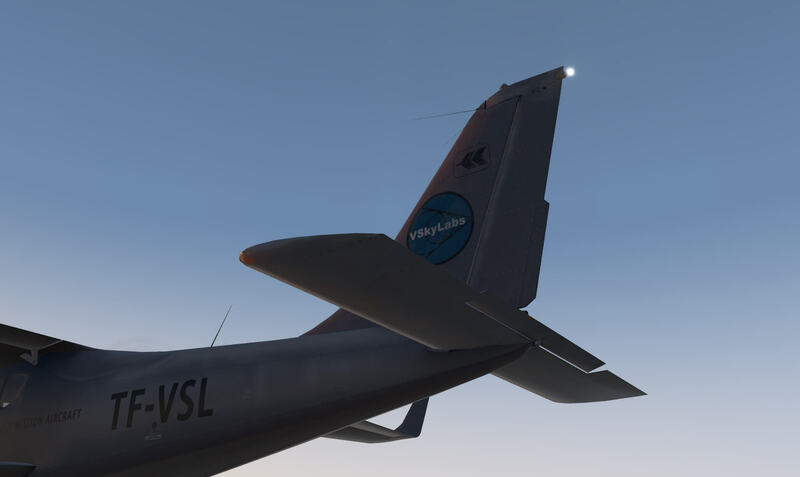 More detailed aircraft information, as stated in the README document, can be found at the dedicated VSkyLabs web page as well as forum discussions at the dedicated X-pLane.Org page. 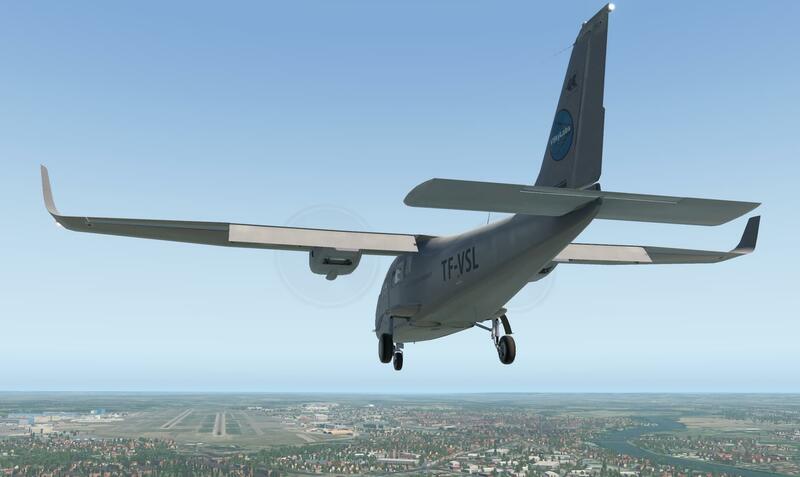 By the way, the dedicated VSkyLabs PT2006 web page also offers many movies to get the right impression on this modeled aircraft. A quick walk-around check tells me that the modeled VSkyLabs model is quite realistic. Not that I checked every inch versus the real Tecnam, but it feels OK. Everything what I expected is modeled, but not all with great detail. The landing gear is nicely done, but it doesn’t show you the tiny details like lines, wires, By the way, the only default livery – there’s no liveries folder included – doesn’t come with any weathering. Weathering or not is a matter if the developer likes this or not. That said, the model is I think a bit too clean, a bit too new although this could be modeled on purpose. When zooming in a couple of decals, I’m impressed that they are sharp thus you can read them. While spotting around, I also have a look at the propeller blades and must conclude that these aren’t of a spectacular quality. They are dull, as well as the spinner cone and the de-icing strip and red mark at the end of the propeller are either not correctly aligned with the blade or not sharp. However, from a distance it all looks OK, but what said, zooming in on those details, I’d expected more quality. 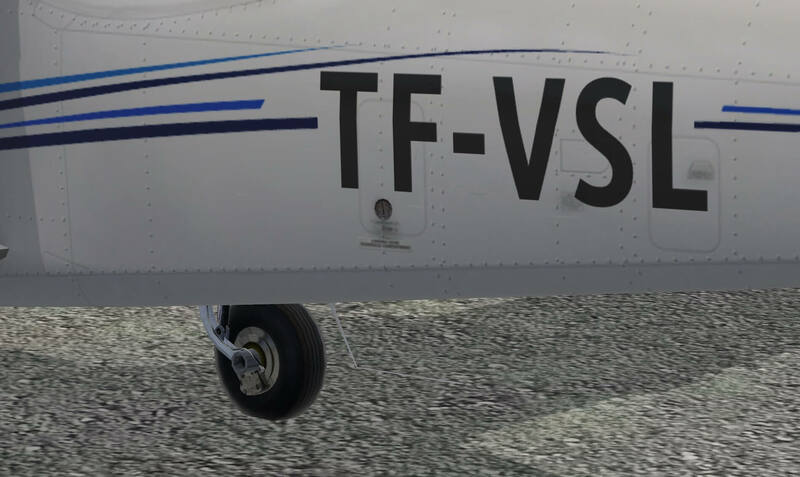 One correction to be made; the decal below the left-hand aircraft registration on the default livery is not sharp at all. I can’t read anything of that. Can it be better? Yes, it can but it depends on the developer or private painter if they are willing to put some energy into this. 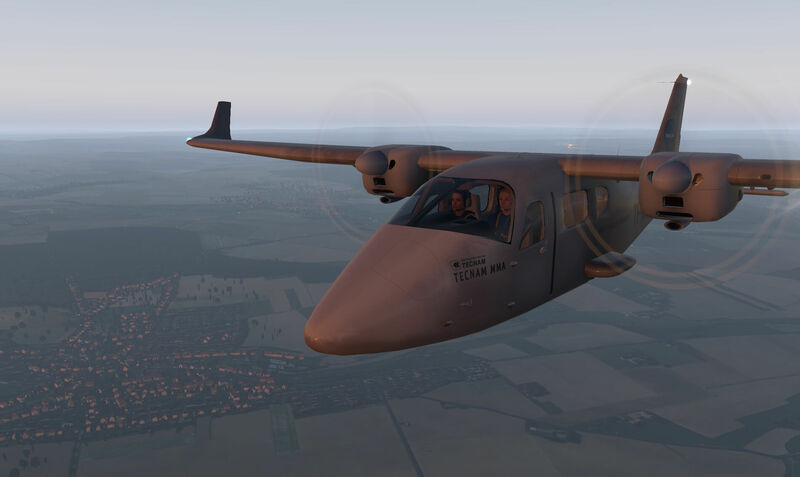 Overall a nicely modeled Tecnam P2600T, but in my humble opinion there’s still some refinement to do to give the overall look and feel that what the model is worth it! 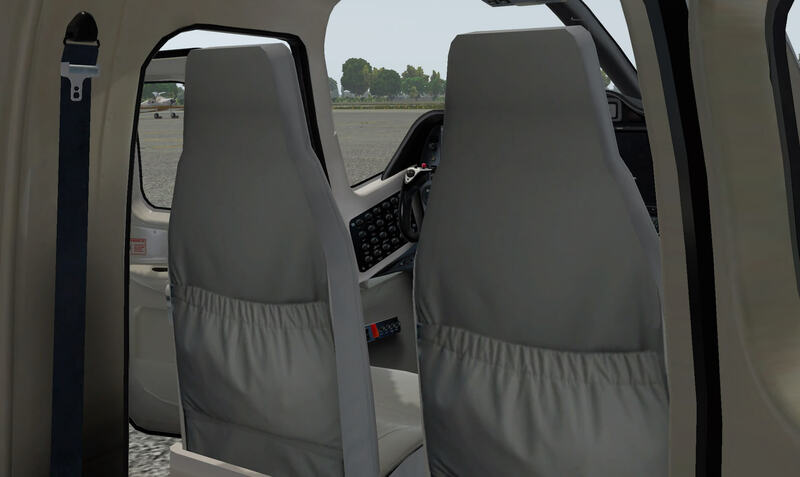 Although I did this inspection on the analog mode, the same implies for the G1000 configuration. Oh yes, there’s a big difference in the layout between the analog and the G1000 cockpit however this has nothing to do how the construction and look and feel of the cockpit sidewalls, floors, seats, pedals, instrument panel construction and so on. That said, I go for “a” model and try to get that VSkyLabs feeling. 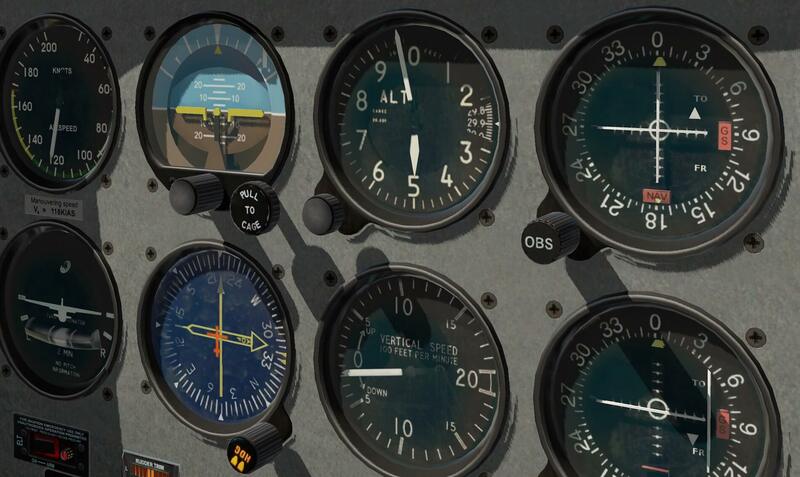 It is weird to see that certain modeled objects like for example the electronic compass (I think it’s electronic and not the old Whiskey compass), the control wheels, the circuit breakers (although not functional and thus not simulated), the Becker ADF instrument, the throttle control plate and a couple of more are very realistically modeled. They do give me the feeling that a lot of time and effort is put into it, but there are also parts that have lack of realism. 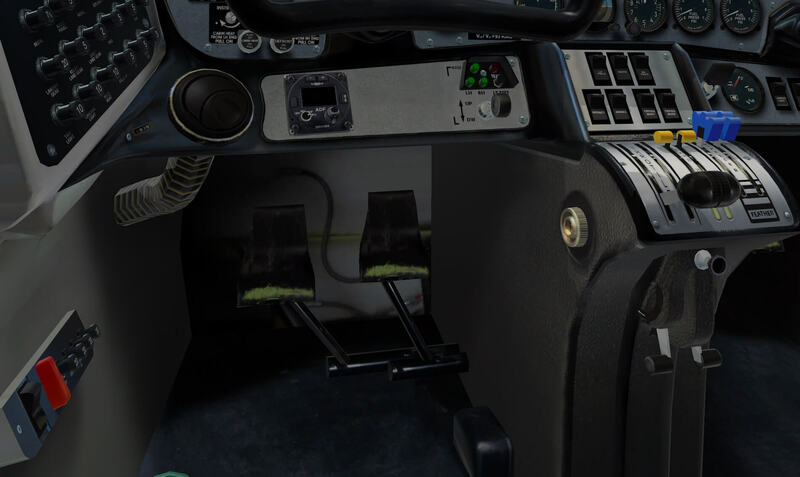 For example, the brake/rudder pedals, the green (???) 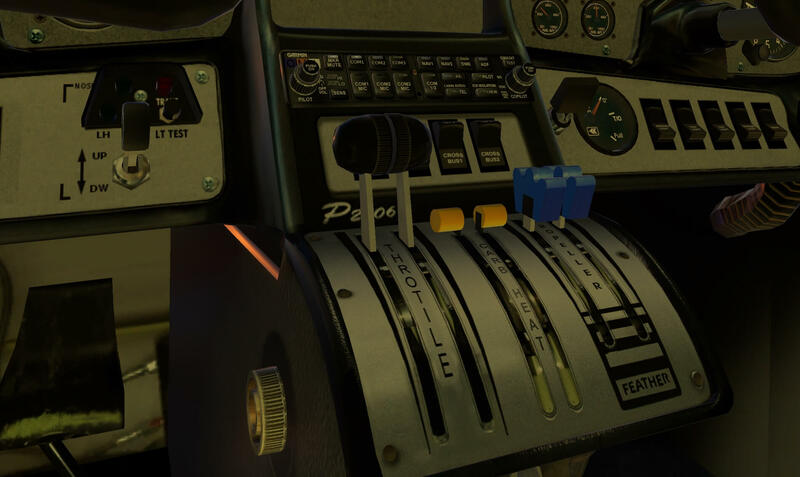 fire extinguisher (not enough polygons used to model a round bottle), the air hose connection to the front panel air outlet (not enough polygons used to model a hose), the rear panel texture underneath the instrument panel and behind the pedals. When you read the above you’ll think …. not my airplane, but hold on, I’m still investigating the other instruments and yes, even with the G1000 layout, these old-fashioned instruments are looking great, they are sharp, and although some weathering is missing, they look nice. Moving around in the 3D cockpit and passenger compartment, I have to be honest to myself and to all the readers; don’t expect high quality sidewalls, ceiling, floor etc. It’s basic, nothing wrong with that, but for a payware model you and I may expect more. I sincerely hope since it’s a constant updated model, that the developers try to improve this too. 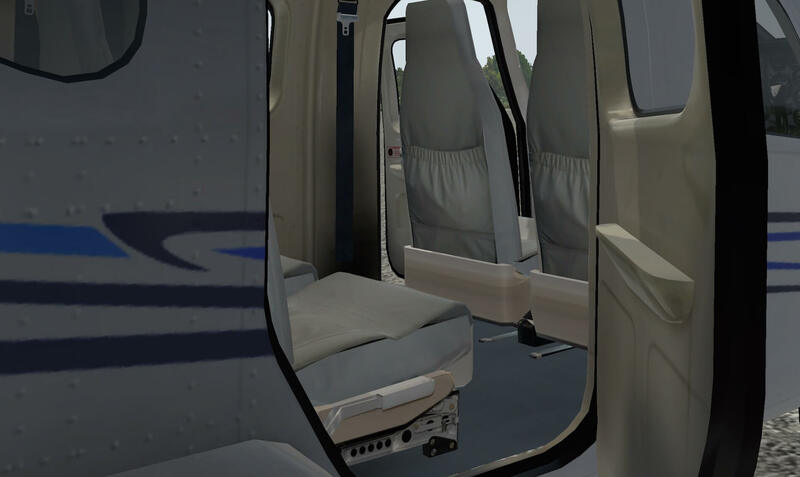 Flight characteristics are important, for some of us, the most important ones from the aircraft, but you may also expect a well modeled and realistic looking interior. Ok, it’s time to do a short flight, just to get the right feeling, but first, the following information regarding the modeled instruments and the used Garmin equipment which I received from VSkyLabs. 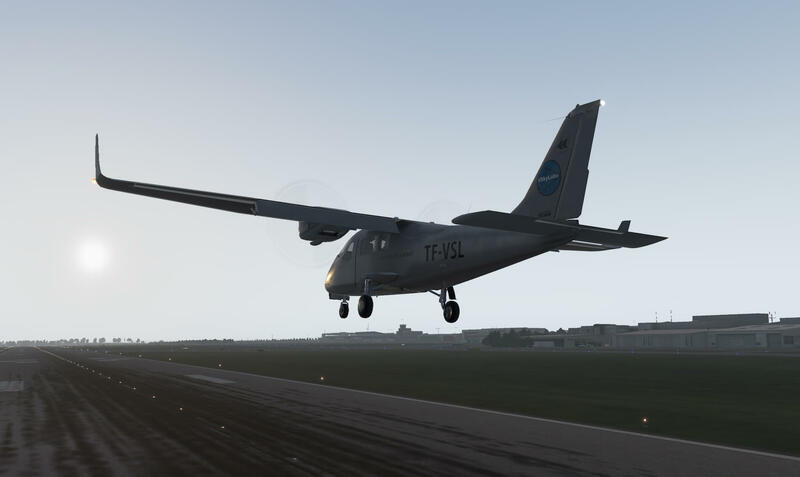 According to JetManHuss “the analog aircraft model is featuring the default X-Plane 11Garmin GSN530 and GNS 430 equipment, but at the same time all analog indications are 3D modelled which are part of the VSkyLabs 3D model. 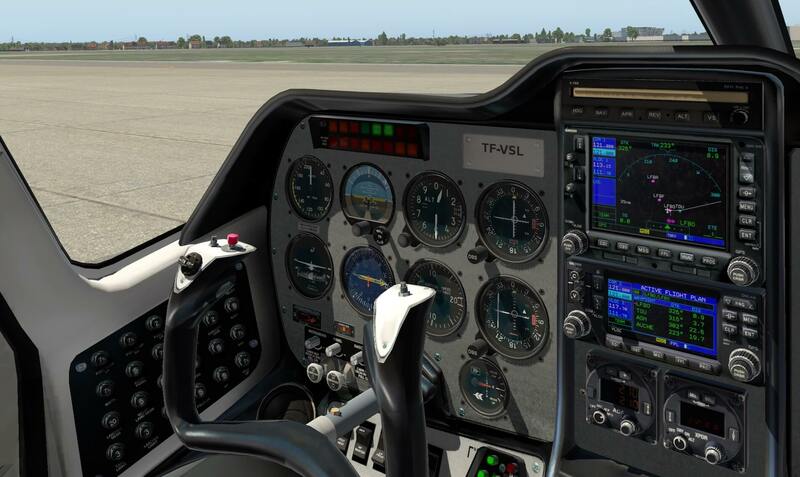 The G1000 aircraft model is using the default X-Plane 11 LR G1000 avionics. The included G1000 was not dedicated build by VSkyLabs. 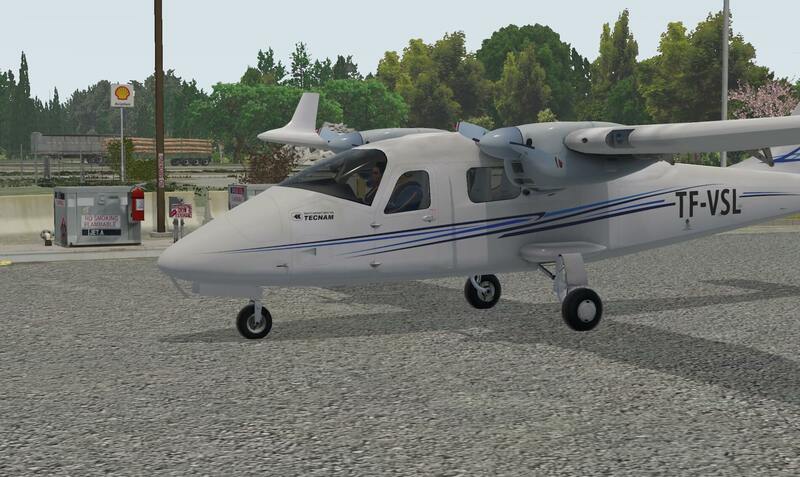 This aircraft was designed to feature and to be based around the X-Plane’s G1000, but the few analog indicators are built by VSkyLabs. That said, I decided to make a short “off you go” test flight. 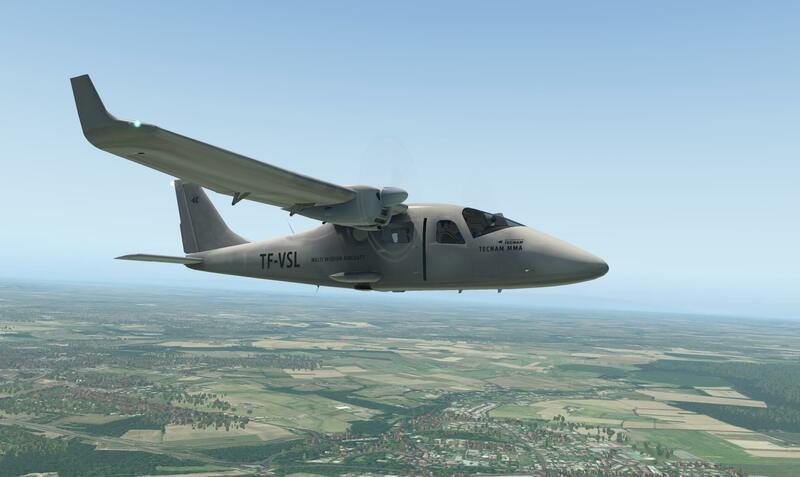 Just to get the right VSkyLabs Tecnam feeling. No navigation, perhaps a VOR tuning, and for the rest, VFR and when needed, I select the Auto Pilot to make it myself a bit easier. I decided to fly with the analog model, just as a starter. Taxiing and take-off aren’t spectacular although the only thing I noticed what the simulated bumping effect on the runway. 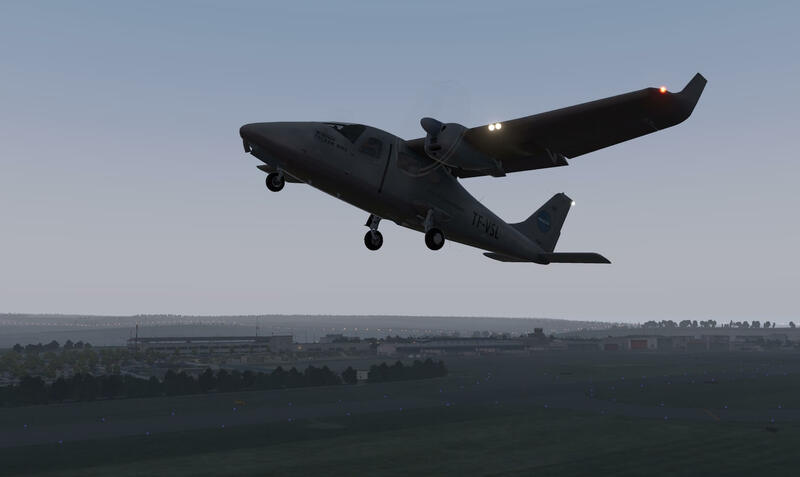 It could be caused by X-Plane or it is implemented in the Tecnam. Overall a nice experience. Climbing out, and retracting the landing gear turned out to be nicely modelled. The gears retract in a way you can expect. Not within 2 seconds retracted, no, it takes the time to do so. The same with the flaps. Well done. When the trims are set, it’s such an easy aircraft to fly. How real this “easy” flying is, is something I don’t know, but VSkyLabs is known about their flight dynamic programming. 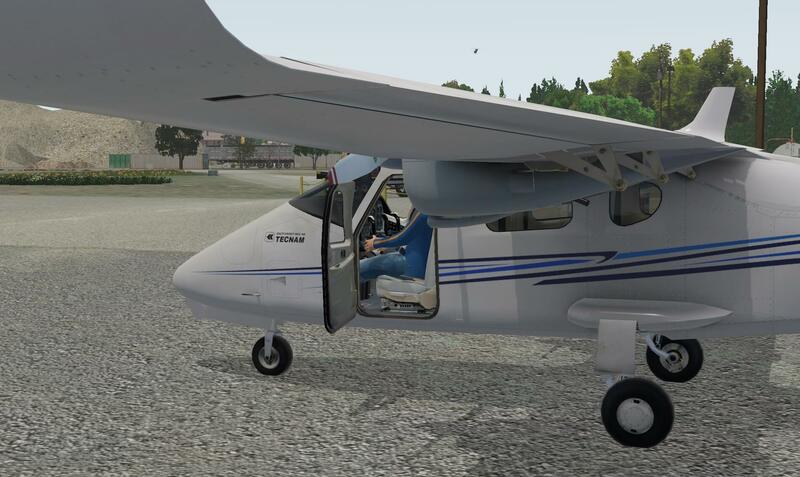 Flying the Tecnam by hand and trimming it, is OK. 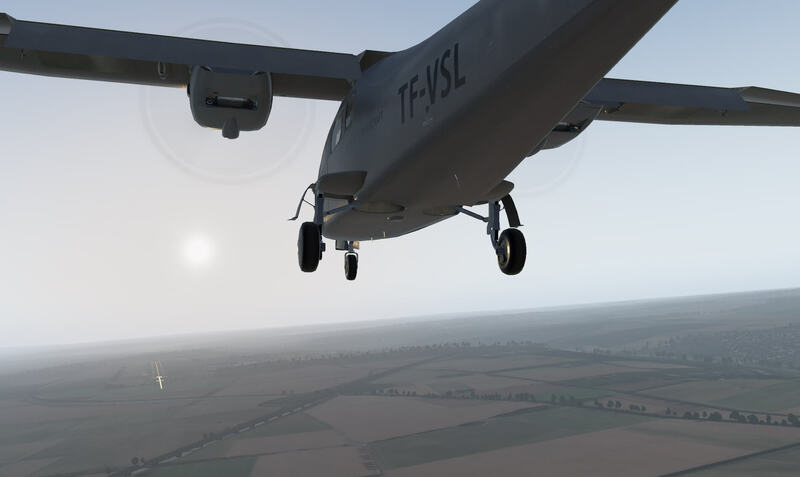 Connecting the Auto Pilot and testing it in different modes – for now only the VS, ALT HLD, HDG and VOR (NAV) modes – works OK, but that’s no specific VSkyLabs programming, but using the default X-Plane AP. I’m aware that while reviewing this version 4.0, an update is in the making namely version 4.1. 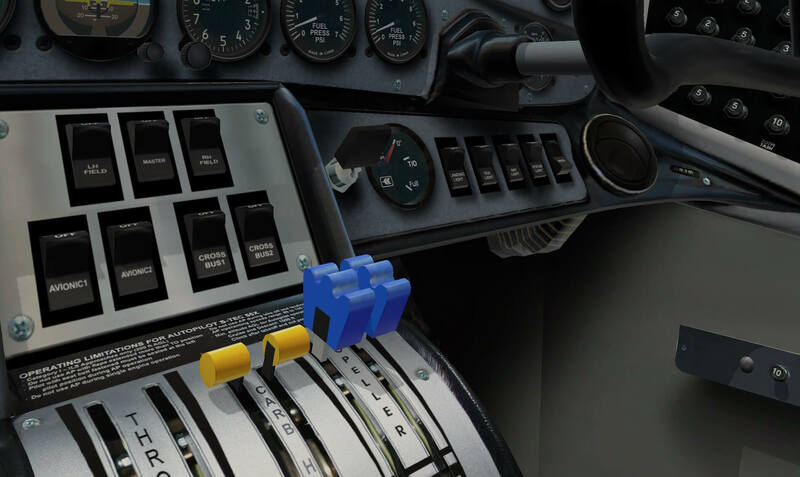 For now, I noticed on my macOS Sierra with X-Plane 11.10b8, that when for example controlling another heading or turning the OBS knobs or moving the FLAP handle lever, there’s either an arrow on the left or right of the knob. It’s a half a circle of whatsoever to control a knob. If this is made/programming intentionally, then it’s OK. It works, so nothing wrong with that, but different then expected. This is by the way not applicable for the Garmin GNS430/530, but Ok, that’s default X-Plane equipment. 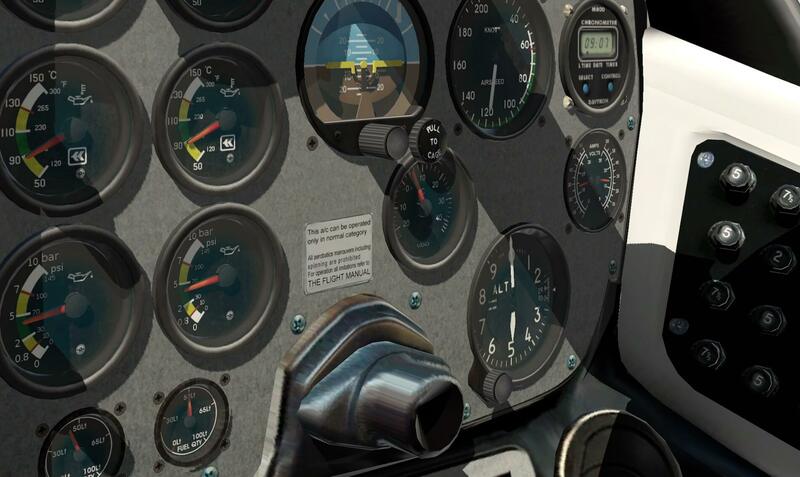 I decided to check this on the right-hand instrument panel and found out that the knobs for the horizon and altimeter do offer a double arrow – mouse pointer – where the mouse can be moved to the left or right. A bit easier! Another note to this; the PULL TO CAGE knobs on both sides of the instrument panels don’t work. They have no function! With the AP connected, I can check a couple of other things like the beautifully modelled circuit breakers, but these are not functional. Perhaps that will come in the future although I think that not many simmers use them. 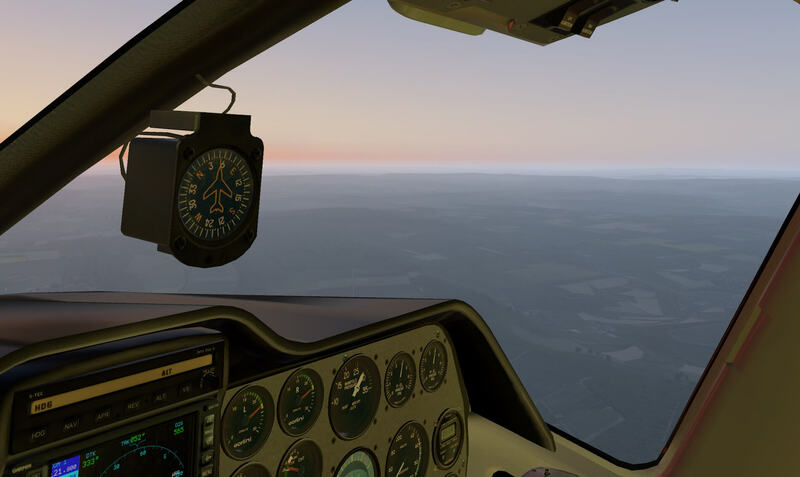 One of the advantages of flying with X-Plane – or any other flight simulator – is that you can change the environmental condition or time of the day with just one setting. I decided to change the time of the day and therefore I was able to check the cockpit lighting. On the left-hand side of the instrument panel, lower side you have three rheostats; INSTRUMENTS, PANEL and SWITCHES. I leave for the moment in the middle what switches means, but when I turn this rheostat, the red cockpit panel flood light changes. Although I can’t follow the word “switches”, the red cockpit panel flood light looks nice. What the “panel” light rheostat is doing, I don’t know. I think it’s not connected to anything. And finally, the “instruments” rheostat; by default, in the analog cockpit, all the instruments except the navigation panels, are integrally illuminated. When I turn this “instruments” rheostat, the only instrument that are integrally illuminated are those in the mid-section thus for example the Garmin GNS 430/530. Is this OK as it is now? Anyway, during this test flight I switched constantly between manual flying and using the AP. After a while having a good feeling about this first impressions, it’s time to go back. Since the nearby airport has a VOR beacon, I use this one find my way back to the airport. Since I do it all under VFR conditions, there’s nothing g to worry about. 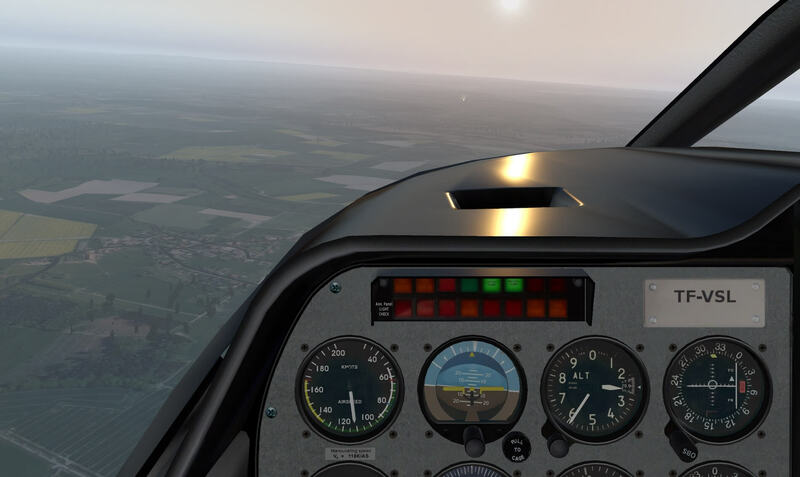 What said in the beginning of this section, I’m not sure how real the flight dynamics are, but the aircraft flies gorgeous, so easy to control, so easy to handle and that with reasonable speeds. I didn’t expect too many issues, and I was right in that. Once close to the airport, I see the runways down below me, and take one, and based on that decision, I follow the flight path with the help of PAPI. Before I know, I’m on the ground and without difficulties. Even at slow speeds the P2600T is easy to handle. 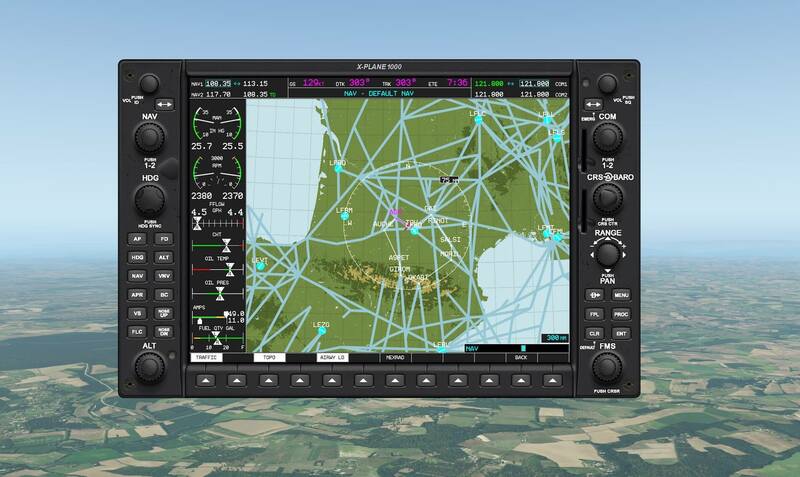 Next in row is a test flight by using the Garmin GNS 430/530 in the analog model. To make this happen, I make again a flight in southern France, Blagnac/Toulouse. Then there’s also the browser-based Online Flight Planner, but I go for SkyVector, but I need for this X-PlaneTools. You and I all know SkyVector, but SkyVector saves your flight plan in fpl format which in turn can be converted to fms with X-PlaneTools. 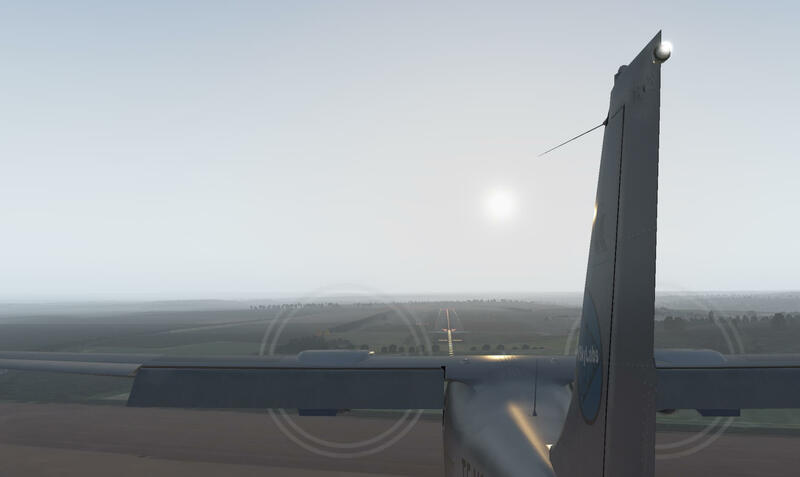 I prefer to create a sightseeing IFR flight, so I use SkyVector above all the other options since it allows me to add waypoints on my scenic IFR route. 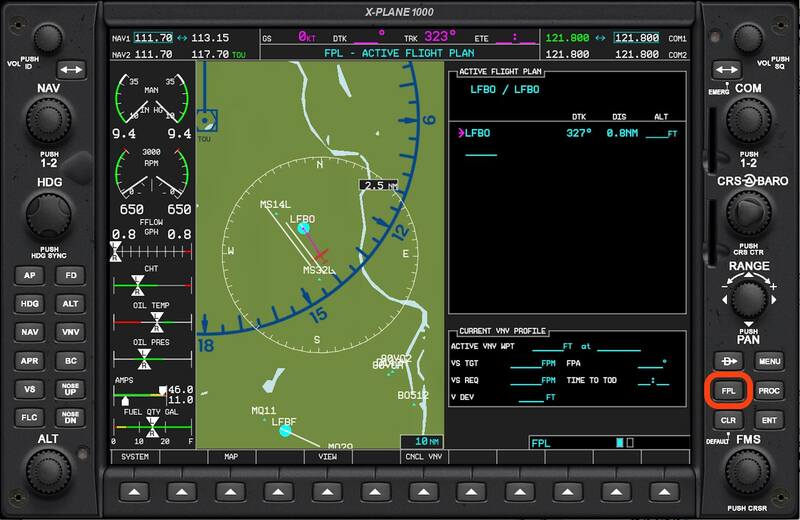 Loading the flight plan in your GNS530 could be easy, but for some reason I hear from many simmers that it isn’t so easy as they had hoped for. Right, let me help you with that in case you’ve not done this before or in case you’re struggling with loading flight plans in the Garmin navigation devices. Copy the created fms file into the X-Plane root folder Output/FMS plans. 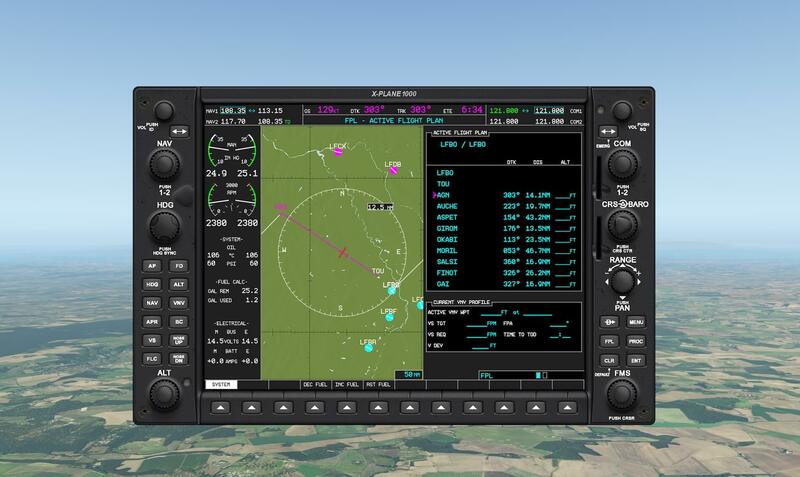 With the fms file in this folder, you’re able to load the flight plan into the Garmin GNS 530. Once you loaded the aircraft and powered it up, click the flight plan button till you got the empty “ACTIVE FLIGHT PLAN” page. Next click once on the right hand inner knob. The saved flight plan(s) come into view. Click the PUSH CRSR button to highlight the upper flight plan. If this is the flight plan you need, click then the ENT button else place the mouse symbol at the right-hand side of the outer knob from the PUSH CRSR button. In both cases, the previous page is replaced by a “FLIGHT PLAN CATALOG”. Just to clarify; when the “FLIGHT PLAN CATALOG” page only shows one flight plan, then this is most likely yours. When you have more flight plans installed, then click as many times as needed on the right hand outer ring of the knob. Once your flight plan is highlighted, click the ENT (enter) pushbutton. Your GNS 530 goes back to the overview page and shows a loaded flight plan. It turns out that it’s better and easier to use for this the popup window of the GNS 530, but that’s also a personal taste. One thing to keep in mind is don’t forget to select on the GNS530 the CDI to GPS. By default, it shows in white VLOC. You need the green GPS above the CDI button else you can’t connect the AP to the Garmin. 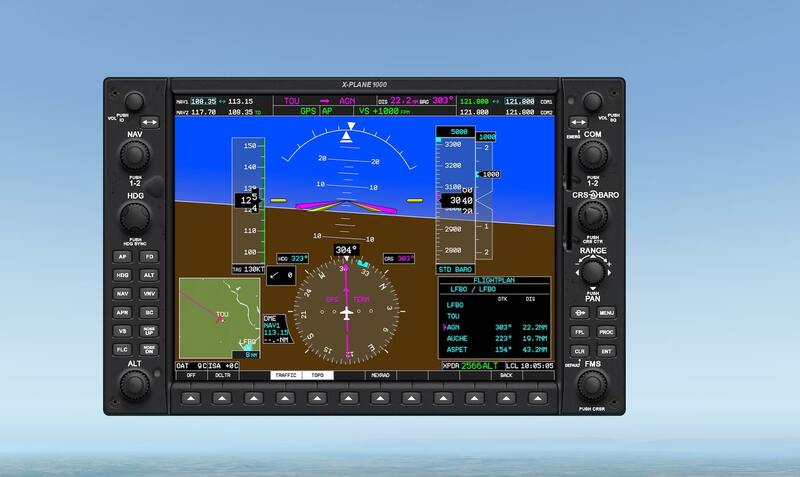 As you’ve seen in the previous paragraphs, I used the Garmin GNS530 for loading my flight plan, but as we all know, you could also load in into the GNS430. The procedure for this is basically the same. What said before, this is a test flight with departing and arriving from LFBO (Toulouse/Blagnac International Airport). I’ve parked my Tecnam somewhere at the old Blagnac side GA aircraft apron. Taxiing to the runway won’t take long since I’m curious about how the GNS functions. Oh yes, I know, the GNS and the AP are all Laminar Research software, so that should work, right? But first I want to highlight something from the previous paragraph and that deals with the GNS 530 and 430. I’ve loaded my flight plan in the GNS 530 and had hoped that this was automatically done in the GNS 430, but no way. As in real, when an aircraft has two of these similar Garmin units installed, they act as individual units and so as it is in this Tecnam. 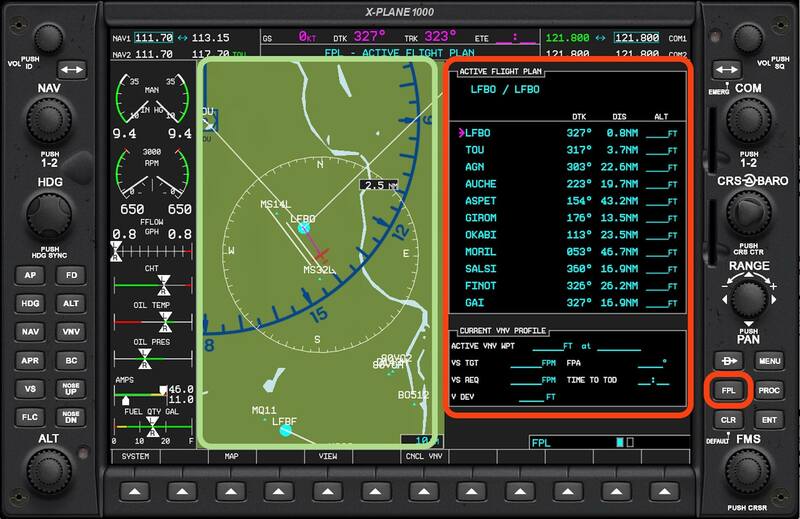 When you’ll loaded the flight plan in the GNS 530, you need to do the same actions for the GNS 430, at least, when you want to have on the GNS 430 the waypoints shown and on the GNS 530 the map. Just before take-off I’ve set my runway HDG. Further preselection’s aren’t needed or not possible. Don’t forget to set the GNS 530 CDI to GPS. The bumping take-off is also here the same and this has nothing to do with the runway construction. This is a feature added by VSkyLabs to give during the take-off a realistic bumping feeling while the aircraft accelerates. Once in the air, I set the AP for HDG and a V/S. A bit later when I’ve finished other jobs to perform, I change to NAV mode. Either the NAV AP is used to follow VOR or VORTAC waypoints, in this case it’s following my FMS flight plan, therefore you need to set on the GNS530 the CDI indication to GPS or visa versa to VLOC when using VOR tracking. While the flight continues with NAV and ALT hold which I had set at 5000 feet cruising altitude, I enjoy the external view. On purpose, I had set the environmental conditions to CAVOK. 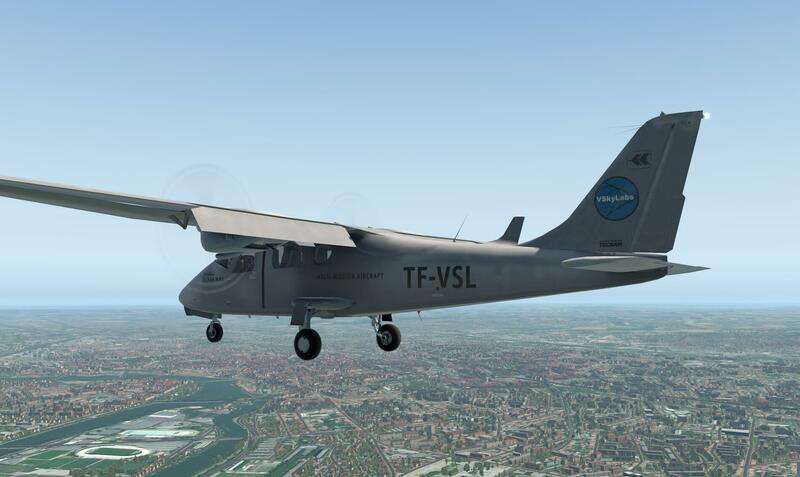 This to be sure that the Tecnam flies as expected. Whenever you have “a” kind of weather downloaded, created or whatever, you see for instance the V/S indicator moving UP and DOWN etc. Not that this is unusual even with the AP connected, but suppose it was doing it also with CAVOK conditions, then there’s something wrong. 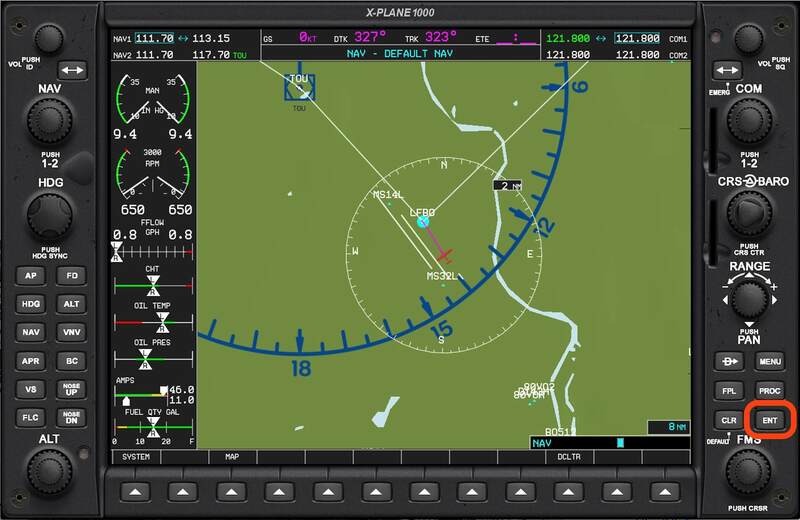 I could continue and continue, but I’ve seen that using the analog model with the Garmin GNS530/430 in combination with the AP, that works as far as I’ve seen, tested, flown as expected, so good news, right? The only thing I’m right interested in is an ILS approach. It should work since it’s what’s used is default X-Plane 10.11b7 software. Let me check this out. At the end of the flight plan there’s my arrival airport; LFBO. I decide to make a landing on runway 32R which has an ILS LOC ID of “TD” and a runway heading of 322 and the most important one, a frequency of 108.35. I decide to enter in GNS530 a frequency of 108.35 for VLOC 1 which shows me the indications on the upper OBS with a G/S and LOC bar. When you enter the same frequency also in the lower Garmin GNS 430, then you also have on the lower OBS the LOC and G/S bars. During my approach, and don’t forget to set on the AP panel APR, the Tecnam follows the LOC and later on the G/S signals perfectly. The only thing you and I need to keep in mind is monitoring and adjusting the speed, flaps and landing gear and of course the flare. Hold on, one note regarding the flare. The flare is something you and I need to do ourselves thus the AP must be switched OFF before, let’s say at final approach around 400 feet AGL. 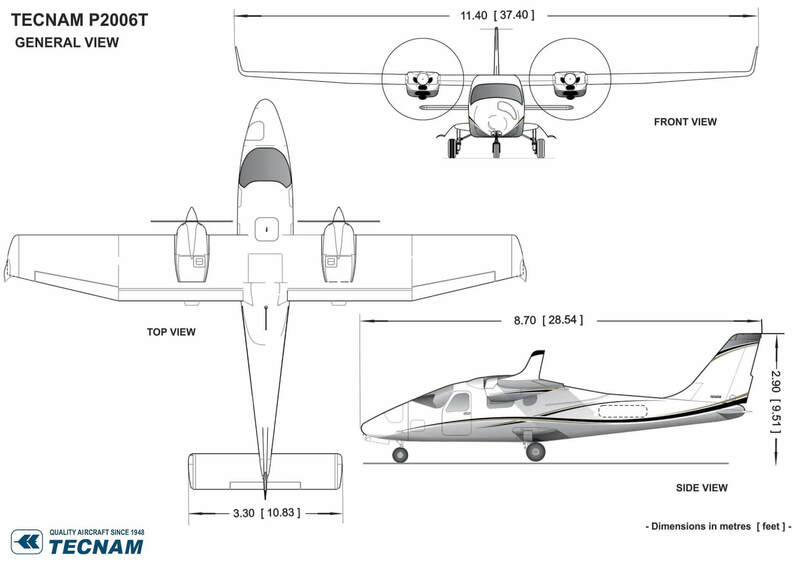 The Tecnam gradually drops with a V/S of somewhere between 500-700 feet/minute along the G/S path. 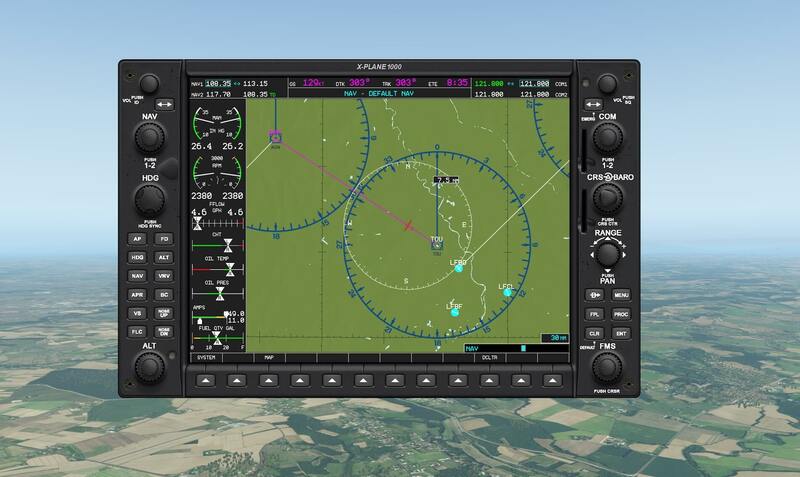 I know it’s more then obvious, but when the AP is disconnected, you can still use the OBS LOC and G/S needles to follow the ILS, so still a guidance for your final landing. 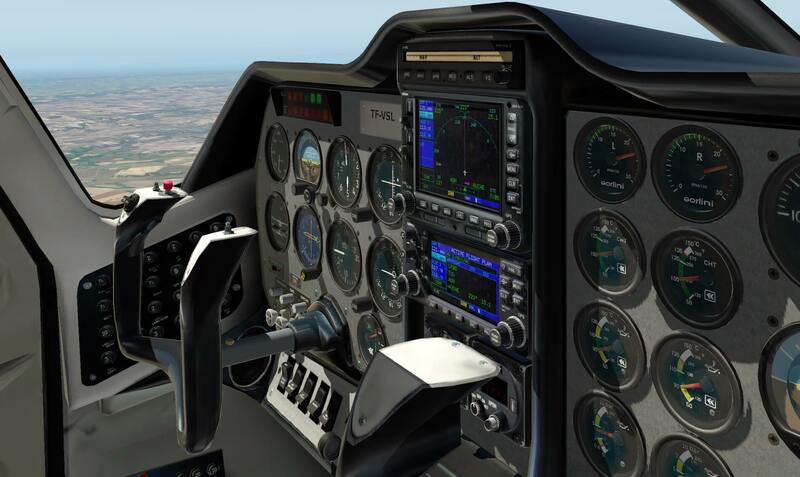 As stated at the dedicated X-Plane.Com web page as perf November 10th 2017 “As part of the free update, X-Plane 11.10 will include a fully implemented G1000. This GPS was designed and programmed by a certified flight instructor to include all the key features and pages needed in training. 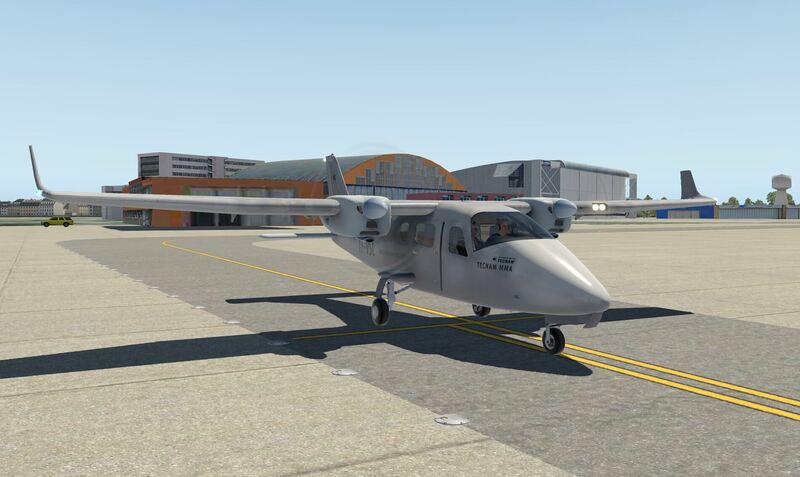 And it comes equipped in a new version of the Cessna 172 by default, as well as the Cirrus SF-50. 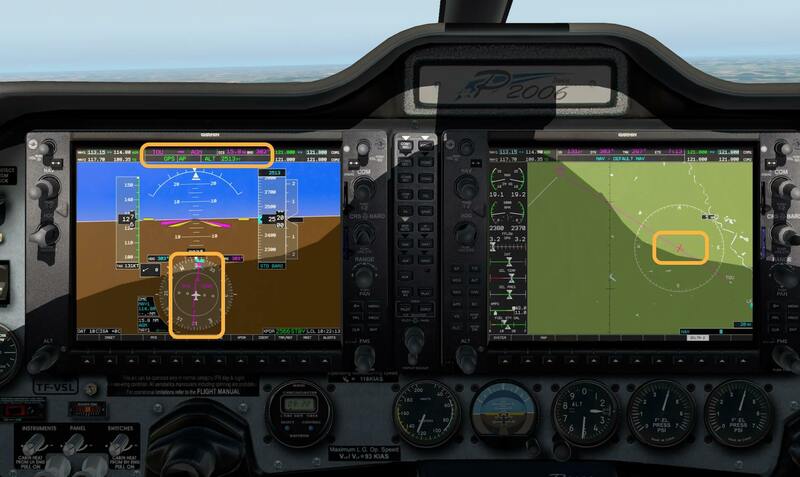 The left-hand G1000 DU is the PFD (Primary Flight Display), the right-hand is the MFD (Multi Function Display). In–between these two you’ll find the audio panel. Why all of this? 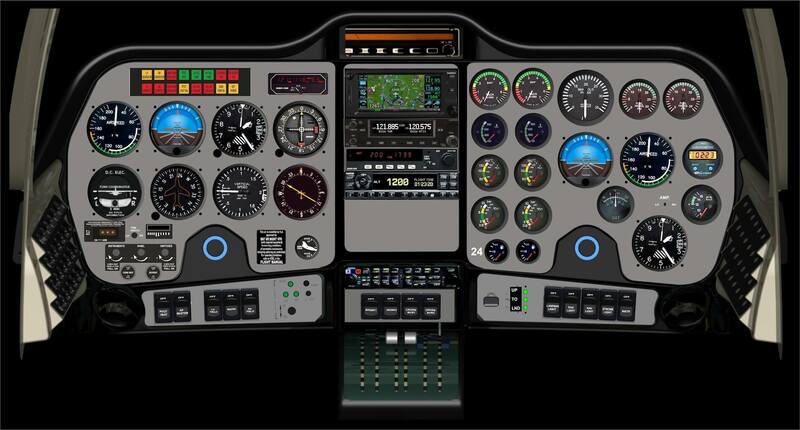 We need when I want to include G1000 test flight in this review, to know where and how to load our flight plan, right? 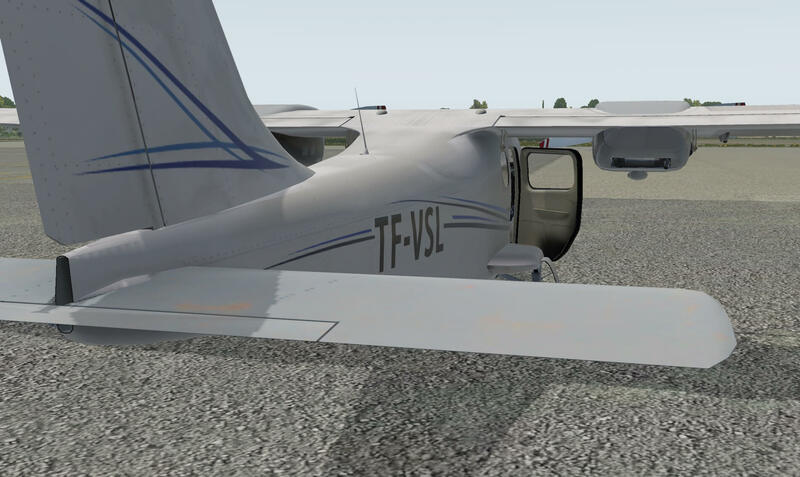 Loading the flight plan in the Tecnam G1000 model is slightly different then you and I are used with the Garmin GNS 430/530. Is it difficult, or do you need to know all the tricks? No, I don’t think so, so let me try to explain this. First, copy the created fms file into the X-Plane root folder Output/FMS plans. 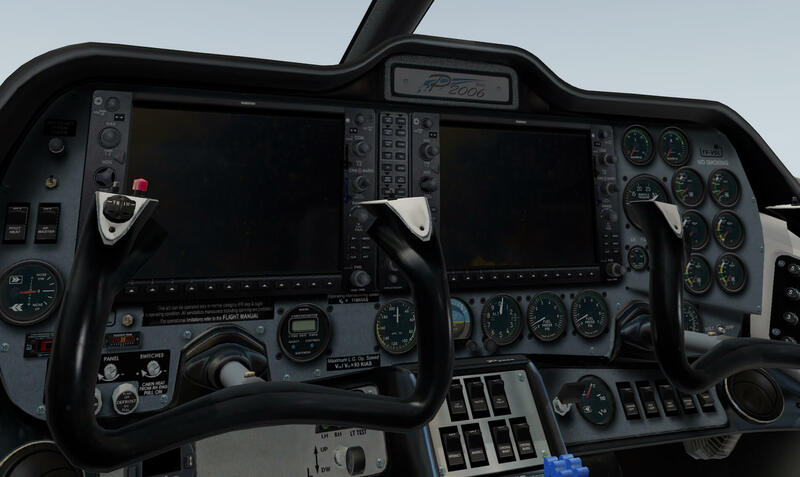 With the fms file in this folder, you’re able to load the flight plan into the G1000 MFD. 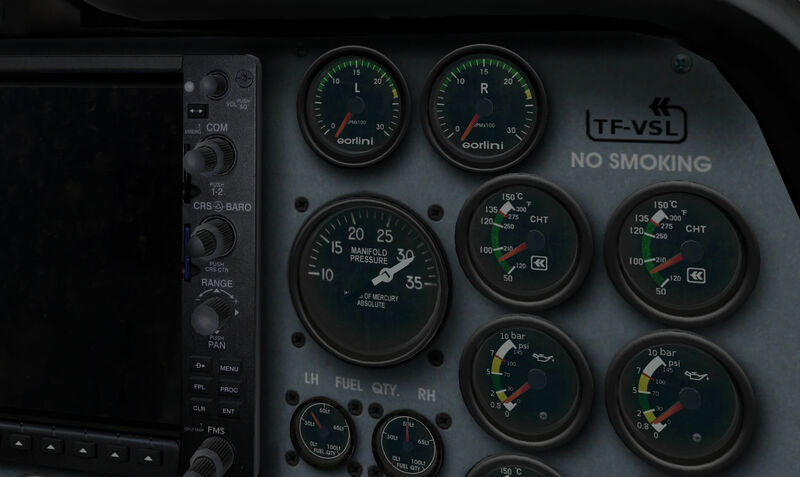 Once you loaded the aircraft and power it up, click the FPL button on the right-hand side of the MFD. A window on the MFD pops up and in the upper window you should see “ACTIVE FLIGHT PLAN”. Next click once on the right hand inner knob (see below). Verify, in this case, isn’t highlighted. Deselecting this waypoint/airport can be done by clicking once on the middle of the FMS PUSH CRSR button. When the waypoint/airport isn’t selected thus isn’t highlighted, move your mouse to the right-hand side of the inner knob and click once. The upper window has changed into the FLIGHT PLAN CATALOG and indicates the FLIGHT PLAN LIST with our flight plan namely LFBOLFBO.fms. Since I’ve only installed one flight plan, you’ll see only one fms file (see below). Next press the middle button of the FMS PUSH CRSR knob. It will highlight our flight plan. Then click the ENT button. The FPL window is closed and depending on the EANGE selector you see less or more parts of the flight plan as can be seen on the screenshot below. When you click the FPL button again, the MAP layout will reduce and a popup window shows you all the waypoints in this flight plan. See below the screenshots belonging to this paragraph. The above “fms loading procedure into the G1000 MFD” is just a straight-forward explanation how to load the flight plan. 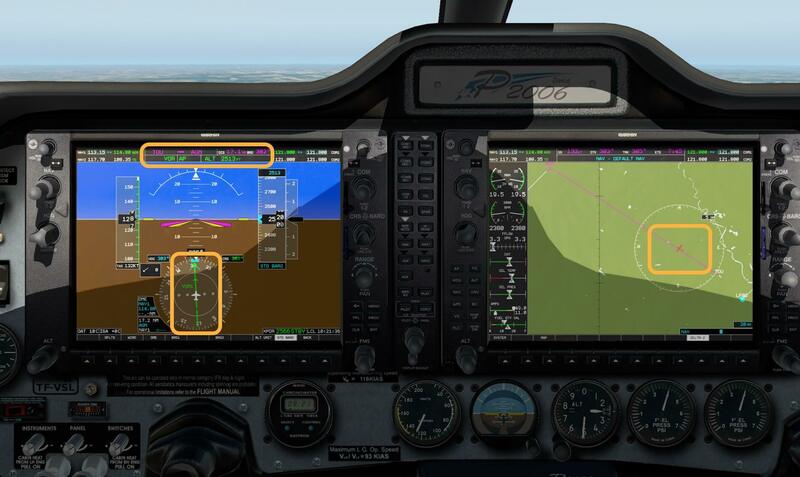 There’s of course more to explain about the new MFD and PFD although many other developers have added their own G1000 creation already in their aircraft. 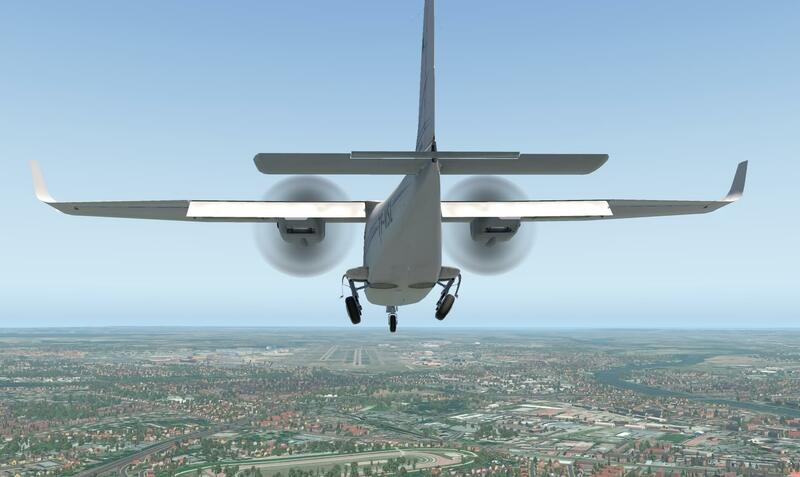 That said, the G1000 DU’s aren’t completely new to X-Plane aircraft. As for today, November 17th 2017, I couldn’t find an explanation on the X-Plane .Com website. Hopefully that’s coming soon! 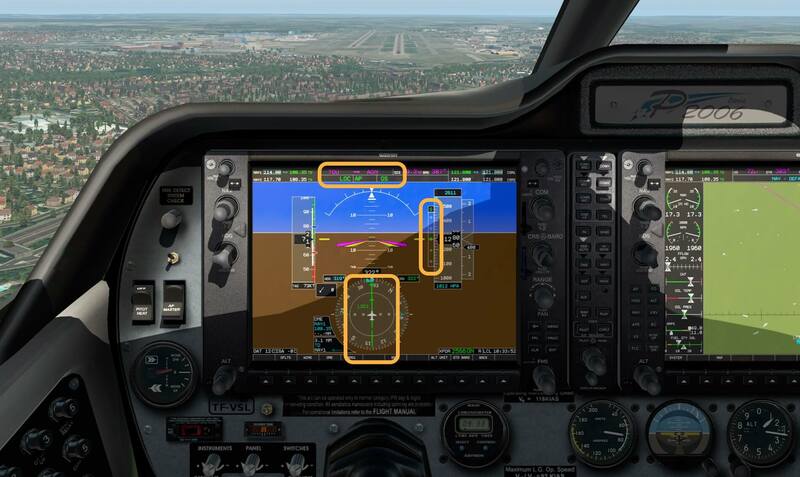 One more thing to keep in mind; as it was already with the default X-Plane GNS430/530 units, clicking on the PFD/MFD G1000 DU offers you a popup version which can also be undocked so being a movable and floatable window. This last test flight won’t be much different then the previous Garmin GNS 530/430 flight. 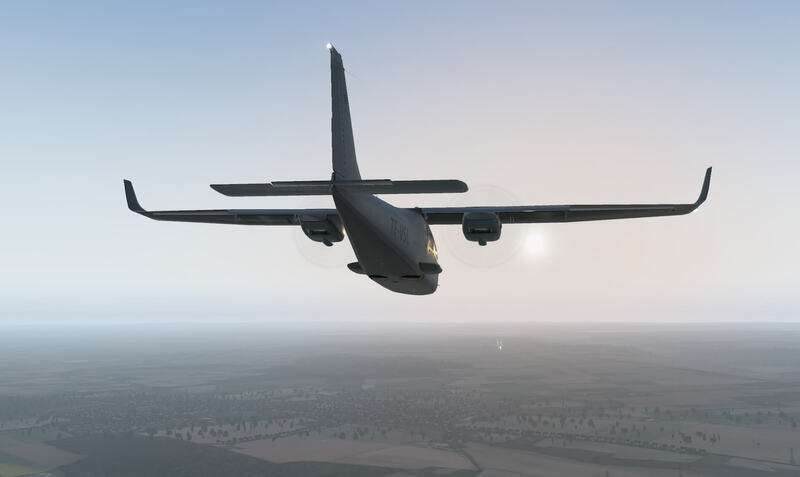 The only difference will be using the default X-Plane 11.10 G1000 equipment. Although there’s no documentation at all, it’s not difficult to find your way thru the PFD and MFD. What I do is basically the same; I set the current runway heading on the PFD, set a V/S and set it for a 1000 feet/minute UP. There’s only one funny thing and perhaps that’s because X-plane 10.11 is still beta and that’s the in-situ PFD (mounted in the instrument panel) and the popup PFD. The in-situ PFD has on the left-hand side no AP buttons. AP buttons can be found at the left-hand side of the MFD, applicable for the in-situ model and the popup MFD, but when you click on the PFD, the popup PFD has suddenly also AP buttons. Weird, but handy! 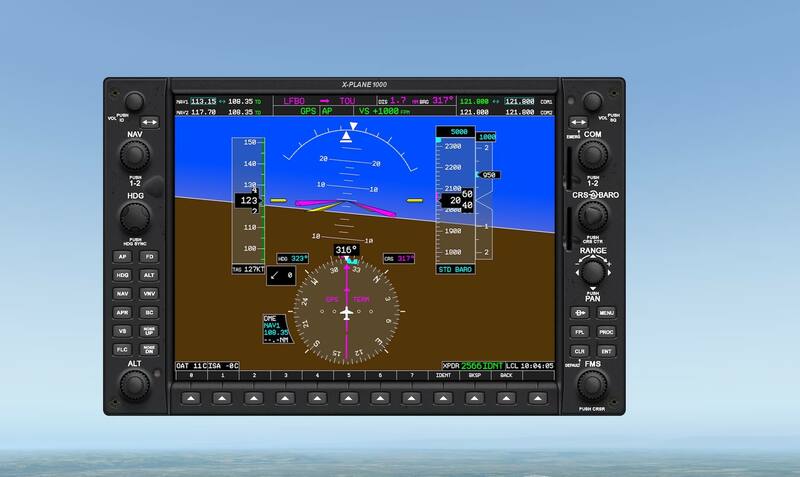 The advantage of the G1000 over the older Garmin GNS530/430 is the wealth of information available on the PFD and MFD. 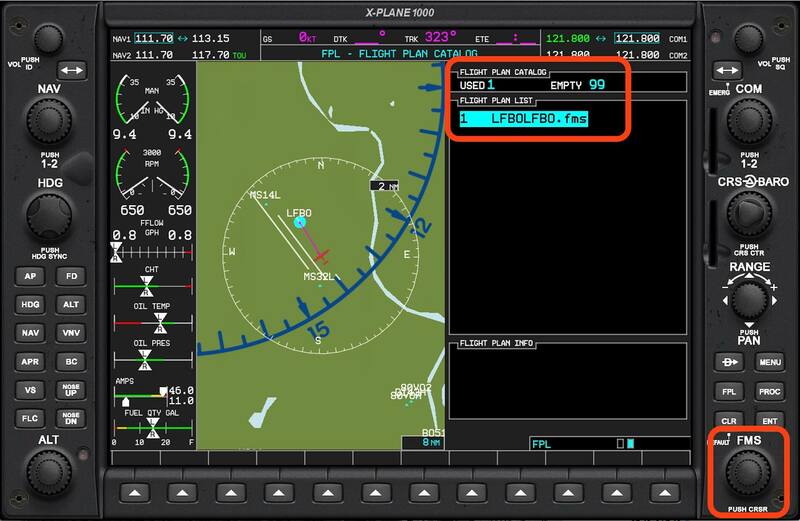 The PFD shows not only the active AP modes, but also settings like V/S, parts of the flight plan next waypoint, the selected HDG and CRS, clearly readable altimeter and V/S scale as well as the IAS tape. Not to forget the compass rose, transponder information and all the additional information that can be retrieved via the buttons on the button of each DU. And this is only a small portion of what’s really possible. It goes too far to highlight every possibility, but I would like to show you below a couple of PFD screenshots. Perhaps I mentioned this already before, the popup PFD and MFD DU’s are resizable, as well as a separate window (click the right-hand upper corner of the floating DU. The popup DU’s have the same switches, knobs etc. on each side of the display, so no need to highlight that. The MFD however offers by default some of the engine indications, oil and fuel values. With the SYSTEM button is clicked, some of the indications are modified and replaced by electrical information. The rest of the display is by default the MAP and depending on inserts, the flight plan list with waypoints can be shown, and related to the flight plan other inserts can be requested like PAGE MENU OPTIONS, PROCEDURES, DIRECT TO etc. These are not new to you and me. This was already, although in a different layout, possible with the older Garmin units. Most of the MFD indications are different, logically, but activating and/or changing AP functions/modes are the same as with the PFD. Have a look to a couple of MFD screenshots below. These where made on a flight departing from LFBO. Selecting VLOC (using a VOR/VORTAC beacon to track) or GPS (using the FMS flight plan) works more or less the same as with the Garmin GNS equipment. The following screenshots show you our path to VOR (or waypoint) AGN. AGN is a VOR beacon with a frequency of 114.80. Since our next waypoint is also AGN, it doesn’t make a difference, thus I could select VLOC or GPS. The upper screenshot shows you flying to AGN on VLOC guidance while the second screenshot shows you guidance via GPS or FMS. In other words, with some references towards the older Garmin GNS systems, it doesn’t look too complex. What said before, there’s much more visual information available compared to a e.g. 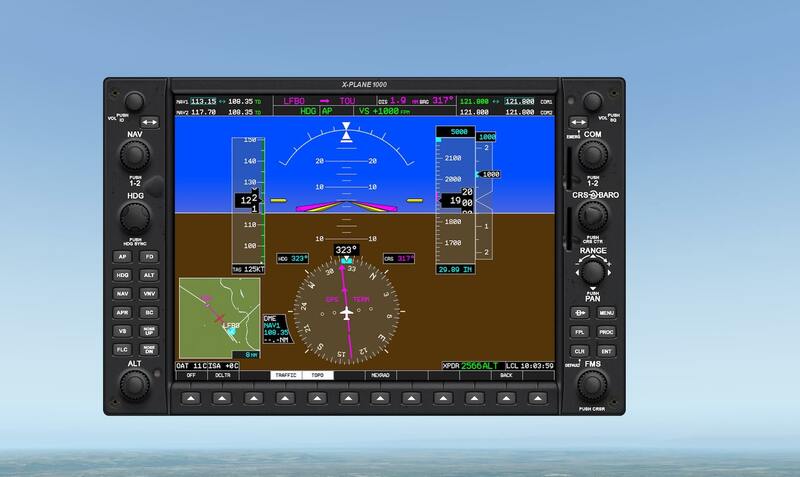 Garmin GNS 530. 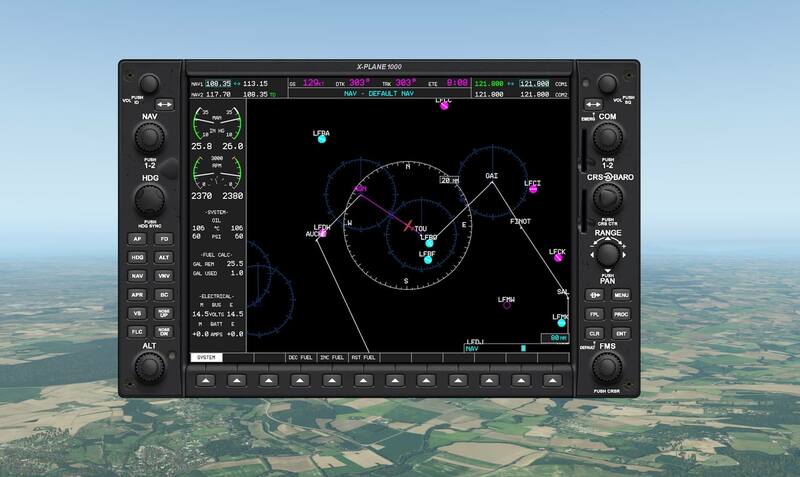 Using the G1000 for an ILS landing isn’t difficult. Select on the PFD popup APR and don’t forget to set the right frequency as well as that the CDI shows LOC1 (2). 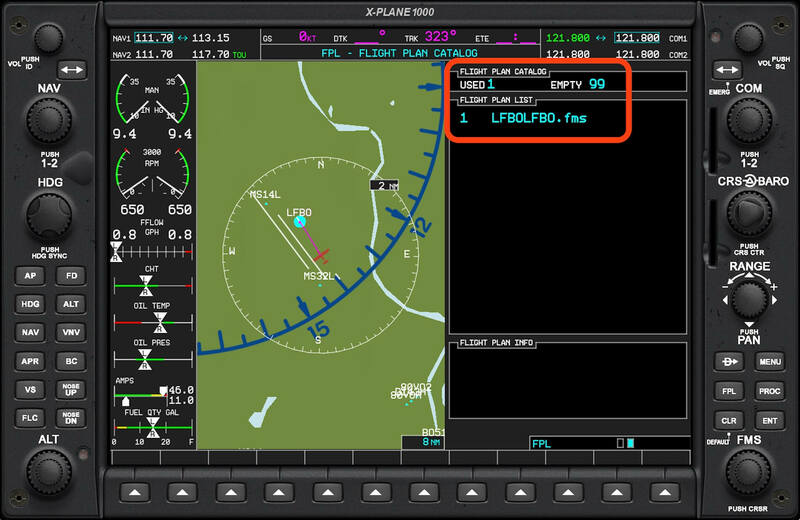 The FMA (Flight Mode Annunciator) on the top of the PFD shows whenever the OC signal is picked up, in green LOC while GS turns green to when the GS path is followed. 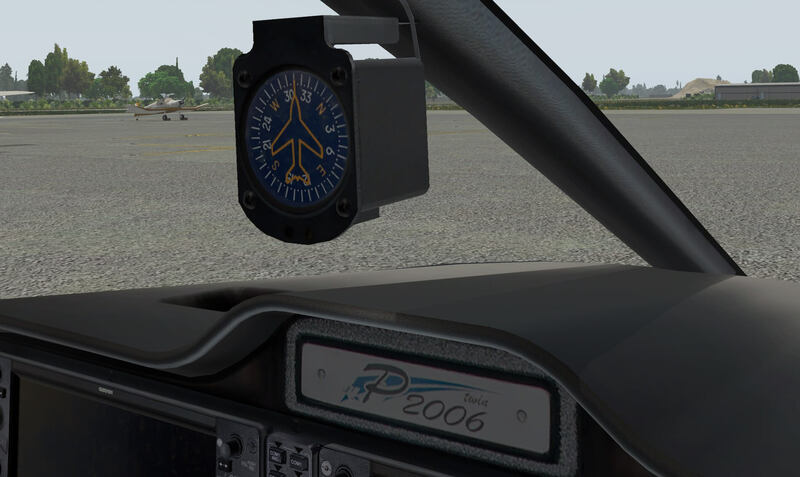 Further on, you can set the runway heading via the CRS knob on the on the right-hand side of the PFD. The compass shows you if you’re following the LOC. The CDI shows either inline or left or right when you’re not fully following the localizer signal. The GS is a bit different. Look at the left-hand side of the altimeter tape. You’ll see a green triangle that should be in the middle of that tape. If in the middle, then you’re on GS track. Above or below the GS path means that the green triangle if above or below the middle. 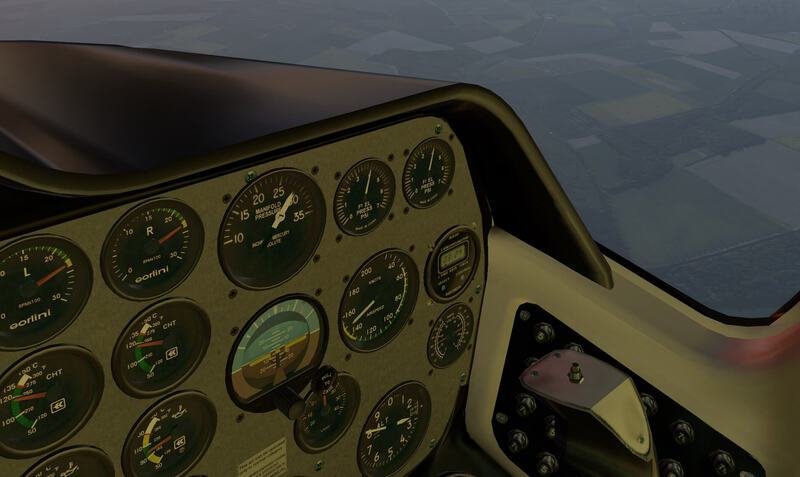 Did I forget something when it comes to the implemented G1000? I think this is enough for the moment. The flight itself, the aircraft behaviour isn’t different. 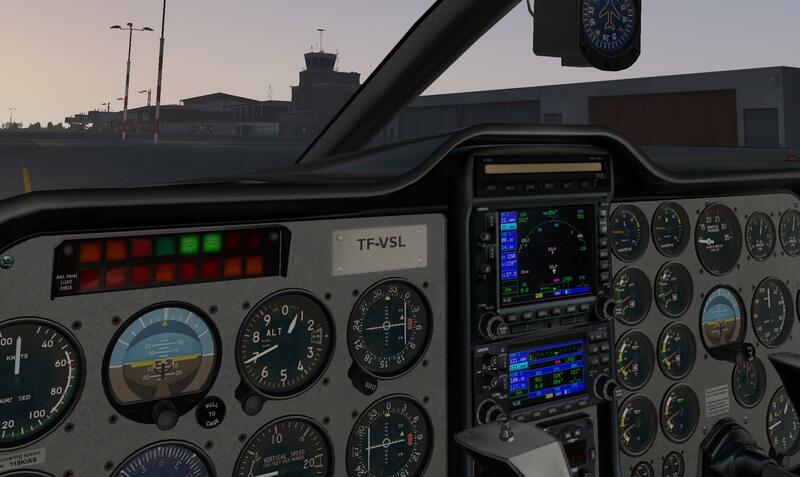 The whole idea of this last flight was to check how it feels to fly with the G1000 and although not new to X-plane aircraft. 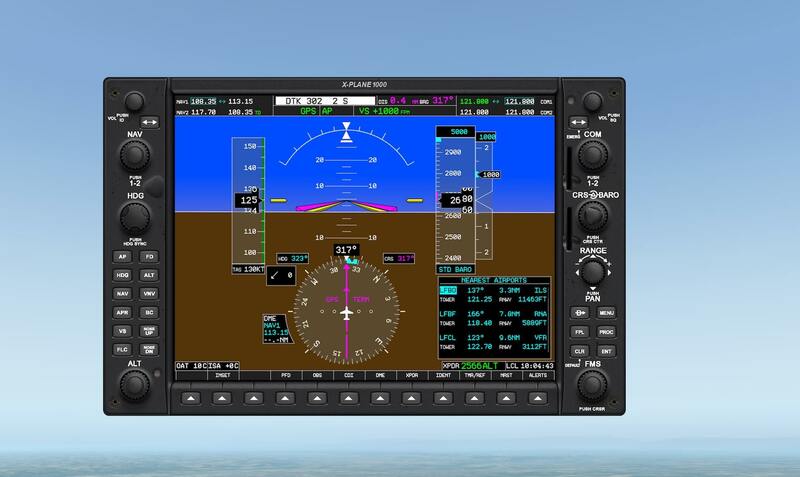 The modelled G1000 MFD and MFD look nice and as far as I’ve seen, it also functions well. For this review, I used a couple of freeware add-on products. Let me highlight these in case you’re interested in these. 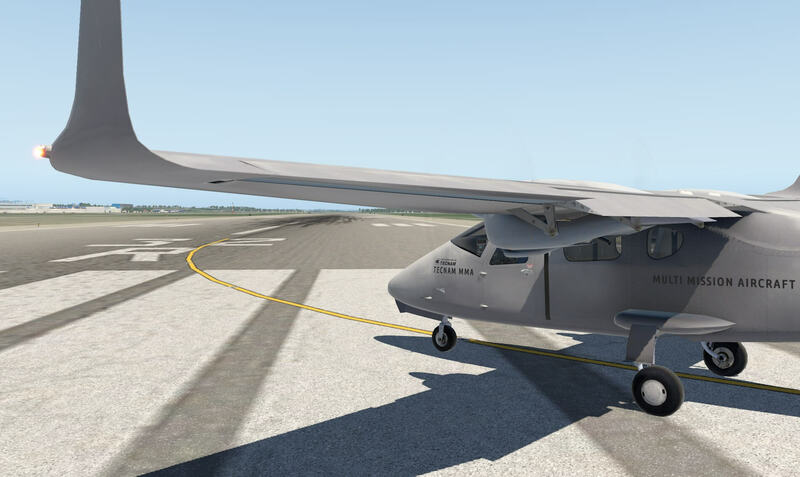 I won’t say that I’ve covered all of the VSkyLabs Tecnam for X-Plane 11.10, but I’m quite sure most of it is discussed. For some reason, the review is longer and more complex then expected. I found it fair to discuss both the analog and G1000 cockpit layouts. The models itself are the same, so no further comparison is needed. 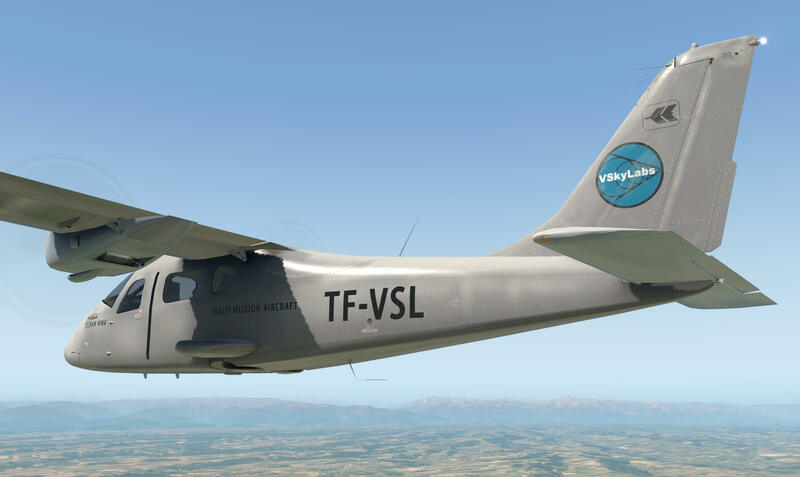 I downloaded a couple of recent painted liveries, but VSkyLabs informed me that previous liveries from older Tecnam version can be used too. That the model doesn’t come with any livery, not really an issue although I would appreciate when some liveries would have been included. The same with manuals. 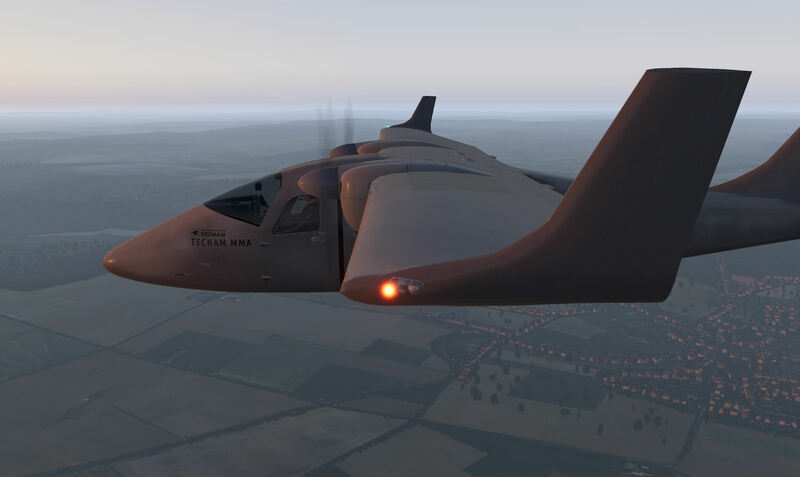 The link to their dedicated Tecnam web page is OK, but I miss an in-depth manual or perhaps for some simmers a tutorial. I had some thoughts in the beginning, but overall, I’m satisfied with what I’ve seen and flown. 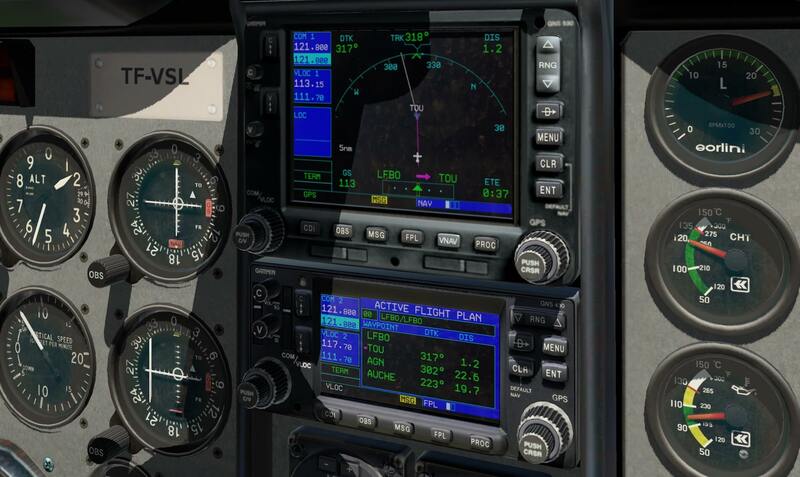 And yes, I’m aware that the Garmin GNS 530/430 and the G1000 are default X-Plane equipment as well as the Auto Pilot. Last but not least … FPS (Frame Rates per Second). I’m satisfied with the frame rates I’ve seen. Yes, I know, it all depends on your hardware, your monitor size and consequently your monitor resolution, your X-Plane rendering settings and so on, but at the end of this review you’ll find my iMac specifications and knowing that, I’m happy with the actual frame rates under different condition. One more thing about the aircraft included “P06T-CHECKLISTS” folder. Each aircraft has this. The folder contains a lot of txt files related to the checklist, but how to handle them, what to do with it etc. 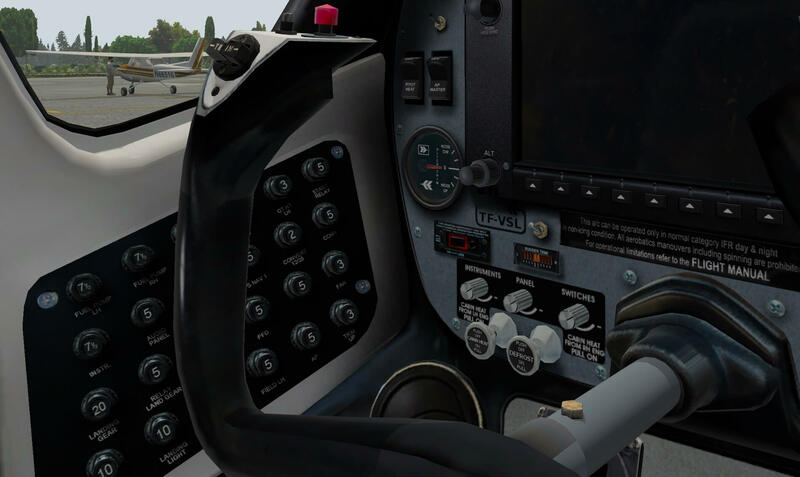 I consulted JetManHuss from VSkyLabs and this was his answer; “These are basic text files to be used with the inherent X-Plane checklist/text files reader. To use it you should load the aircraft and then go to ‘File’ and select Open text file’ or ‘Open checklist’. When opening it as text file, you will see the whole checklist in a pop-up window, with the option to load another file (the next required checklist text file). When opening it as a checklist, you will see one line at a time, also with the option to load another file (the next required checklist text file). Interested in this aircraft add-on after reading this review? Then visit the dedicated X-Plane-Org web page.